STUART—Spectators who gather early at Flagler Park to relax, picnic, and secure prime viewing posts for the City of Stuart’s Fourth of July fireworks celebration will have good reason—three reasons, in fact—to train their gazes skyward well before the first mortars launch. Press Release: An aviation extravaganza took flight over Stuart as the 2018 Audi Stuart Air Show! STUART, Fla (Nov. 29, 2018)- The Audi Stuart Airshow took place from November 2 - 4. The rain couldn't put a damper on our fun! The weekend was full of fireworks, jets, aerobatics displays, aircraft tours, aircraft rides, food, drinks, and fun with friends and family. Children and adults alike were inspired by the aerobatics in the sky, as well as by the aircraft on the ground. STUART, Fl. (Oct. 24, 2018)- On Friday November 2, the Audi Stuart Air Show takes the opportunity to give back to the wonderful children in our community by hosting 650 children at Witham Field. JD Parker Elementary students and YMCA pre-school age children, will all be assembling at Witham Field for a field trip that everyone will be talking about for years to come.This program gives kids an opportunity to learn about aviation through a hands-on approach. Press Release: Elevate your experience at this year's Audi Stuart Air Show, with once-in-a-lifetime flight upgrades! STUART, Fla (Oct. 3, 2018)- It is October and that means that we are just four weeks away from takeoff! This year the Stuart Air Show is delighted to offer numerous ways for you to channel your inner Top Gun pilot from the best seats in the house: the cockpit. Take your seat in history by flying high above the air show action in a vintage aircraft or military helicopter. Organizers of the Audi Stuart Air Show have announced that Marine Attack Squadron 231 is scheduled to appear on November 3 and 4, 2018 at the 29th Annual Audi Stuart Air Show. This will be the first time since 2014 that the AV-8B Harrier has appeared at the Audi Stuart Air Show. 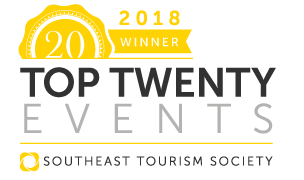 After a thorough review of the 12 states in the Southeast Region, the Southeast Tourism Society has once again named the Stuart Air Show as their award recipient for "STS Top 20 Event" for the third consecutive year. "